The brewery Ehringsdorfer in Weimar even honours him by creating a Van-de-Velde-Edition for their beer bottles. This edition consists of four different designs drafted by Henry van de Velde and used for such different things like textiles, furnishing fabrics or wall decorations. 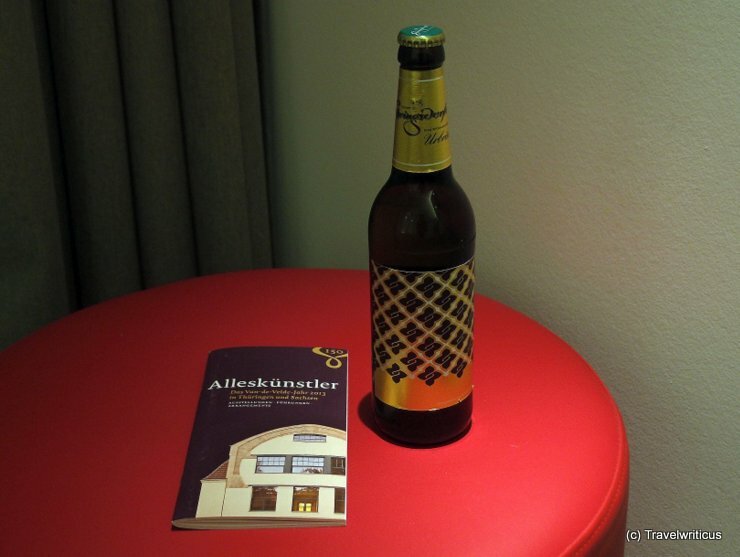 The bottle depicted above, showing a design for a furnishing fabric made of damask, was a present by the Weimar Tourist Board at the Germany Travel Mart (GTM) in Stuttgart. I was very surprised about this combination of beer and design. What do you think about it? This entry was posted in Festivals and tagged Germany, Thuringia, Weimar by Travelwriticus. Bookmark the permalink.